My expectations were low when Passport publisher John Ortega and I accepted an invitation to Swissotel’s Kai, based as they were upon our visit two years ago to the Italian restaurant that previously occupied its space. Snow-bound traffic forced me down to the Metro to the Paveletskaya station. After a short hike I approached one of Moscow’s first modern enclaves, set off by the Moscow River and one of its tributary canals, and the Garden Ring. The Swissotel occupies a prominent space on the east side of the Garden Ring that adjoins one of the first A-class office complexes built in Moscow in the 1990s where many a multi-national first set up shop. The Swissotel followed, built as part of the Moscow International House of Music, the city’s state-of-the-art performance center that opened in 2003. The Swissotel is a spectacular building and the entry and public spaces are grand with soaring views. Kai is on the second floor, which begs a question that nagged me then as it did two years before, “why not on the roof?” The short answer came later when we visited the City Space lounge on the 33rd floor. Its small cocktail tables, wrapped 360 degrees around the building core, offer one of the best, if not the best, views of the city out the tall glass windows that wrap up from practically under the tables’ feet. Perhaps too dizzying for a gourmet restaurant, but fine after a few cocktails. My metro decision paid off. Even though 45 minutes late, I arrived well ahead of my colleagues. 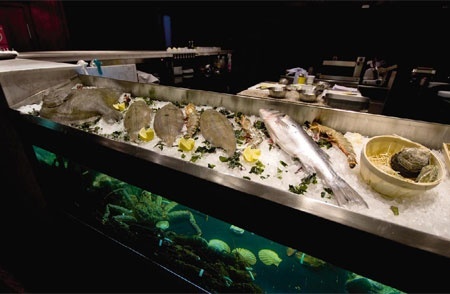 The Kai space is cozy-modern and understated, with tables widely spaced and a small open prep kitchen that displays fresh fish and an aquarium of live Kamchatka crab. Quiet this time on a Monday early evening, Kai would later be full by the time we left. I had time to peruse the menu and wine list. Even the first page of showed that the evening had promise. First – seafood dominates – but then one reads “foie gras, truffle, pigeon, white asparagus,” indicating a French base, and then “wasabi, Shiso, Enoki mushrooms, Sichuan pepper,” a menu full of inviting combinations. Meats are limited to just one page of the eight-page menu. The wine list is extensive, with each line listed twice, the front section sorted by region and the back organized by grape. As might be expected prices soar to the stratosphere, but the bulk are in the $100-$200 range and there are a few decent wines under $100. There are also some I don’t often see in Moscow, an indication that Kai’s list is more than a selection from two or three of the big importers. I found two white Vouvray wines from Huet, a personal favorite that has biodynamic grape production at that. Though the Vouvray were demisec (slightly sweet), I insisted that we try the Clos du Bourg 2005 (3740r) to see how it survived the trip to Moscow. Executive Chef Jean-Michel Hardouin-Atlan joined us at the table. 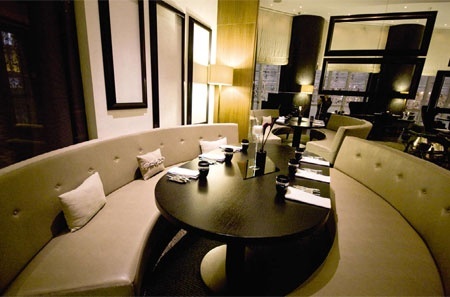 Kai is Jean- Michel’s conception, “terre et mer” (earth and sea) as he calls it, and a French-Asian fusion. He hails from France’s Loire region, but has spent a chef’s life in Hong Kong, Oman, Mauritius and Lebanon. His favorite was Beirut, but sadly the French navy evacuated Jean-Michel and his family to Cyprus during the 2006 Israeli shelling and invasion. Thus he ended up in Moscow two and a half years ago. 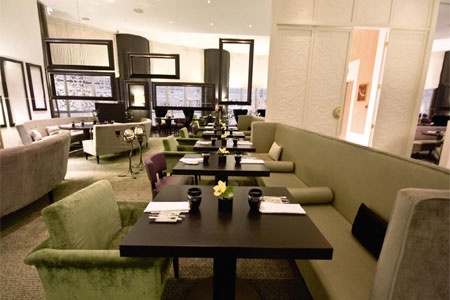 Swissotel has a cadre of visiting celebrity chefs – one usually flies in each month for special meal events. A number of menu entries are noted with the name of the chef who left the recipe behind, as well as the number of Michelin stars held by restaurants where they worked. Late this month, Danial Chambon, chef and owner of Le Pont de l’Ouysse, a one-star Michelin in Souillac in southern France, will be Kai’s guest chef. We expect some specialties from the region’s truffles and foie gras. In honor of our discussion about Lebanon, we decided to try a red Lebanese wine, Chateau Musar 1999 (about 6000r) – this was a disappointment – it did not appear to have traveled well since we have heard very good reports about this winery and a few others in Lebanon. 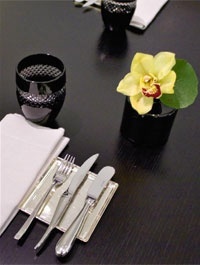 However, we were cheered when a ‘chef’s complement’ from Jean-Michel arrived, a short spear of white asparagus wrapped in a thick black squid ink and rice blanket displayed in an egg sauce. I realized that my earlier expectations would be exceeded. After asking for a few suggestions, we selected cold starters: John had the Raw Sea Scallops with Fresh Marinated Foie Gras and Spices (1250r) and I the Red Tuna Tataki with Roasted Sesame Seeds and Tea Crust Served with Sesame Sauce (650r). Naturally Kai’s seafood is airlifted to Moscow by premium importer La Maree, and this tuna was incredibly fresh, ample rectangular blocks slightly seared in a crust around the edges. For a hot starter I tried the Glazed Sea Scallops with Morel Mushrooms (950r), huge and fresh with a thin glaze that did not try to overpower the scallops. I also went for the Cream of Green Lentil Soup with Forest Mushrooms and Nuts (600r), and John tasted the recommended Red Capiscum Veloute with Ginger, Mediterranean Shellfish and Parmesan Chips (950r). The lentil soup was delightfully hearty. John let me have a spoonful of his selection – very pleasant but not overly sharp. Both were excellent selections on this snowy night. The two starters and soup were enough for me, but others at the table were impressed with their Lightly Smoked Sea Bass with Sturgeon Saviar Served with Celery Root and Vodka Cream Sauce (2450r) and the Steamed Wild Turbot with Baby Vegetables. The aromatic sea-bass, prepared in an in-house alder-wood smoker, was well received. 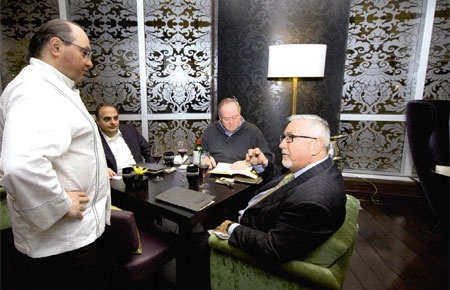 We did not try the meat dishes, but the menu begged an invitation for a return visit to see how Jean Michel treats Black Angus or Australian Lamb Rack at prices that range upwards from 1400 rubles. Most hotel restaurants suffer from identity problems. Hotel management tends to relegate them to a service for guests (ham and eggs at midnight for instance). Few, and usually only at a 5-star hotel, can become a destination establishment to draw clientele into the building by the quality of the food and service. 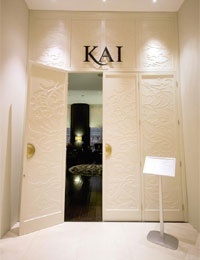 I believe Kai has triumphed, and it certainly can hold its head very high among Moscow’s better dining establishments.